Do you love to take the road less traveled? Are you looking for mud-slingin' thrills? Built to dominate extreme terrain or cater to day-to-day carpools, the Toyota 4Runner is a versatile fan favorite at Downeast Toyota. With the arrival of the 2018 Toyota 4Runner near Bangor, ME, drivers who love the outdoors will discover a capable SUV that is tailor-made for adventure. Visit Downeast Toyota today to get behind the wheel of the 2018 Toyota 4Runner! 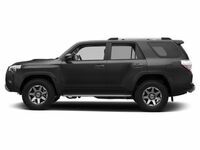 A versatile and capable entry in the SUV segment, the 2018 Toyota 4Runner is available in six trim levels – SR5, SR5 Premium, TRD Off-Road, TRD Off-Road Premium, Limited and TRD Pro – that will start at just $34,410. Perfect for your next family adventure, the Toyota 4Runner makes room for five passengers in standard configurations and is available with third-row seating to make room for seven. Armed with 47.2 cubic feet behind the second-row seats that expands to 89.7 cubic feet, the 4Runner is a fan favorite for family camping trips. With a sturdy, body-on-frame platform, the 2018 Toyota 4Runner near Bangor, ME is built to withstand the punishment of the trail. Under the hood of the Toyota 4Runner, you will find a reliable 270-horsepower 4.0-liter V-6 powermill that is paired with a five-speed automatic transmission to make 17 mpg in the city and 21 mpg on the highway. When properly equipped, the Toyota 4Runner will tow up to 5,000 pounds of cargo. Standard Toyota 4Runner models employ rear-wheel drive with an Automatic Limited Slip Differential that functions as a part of the Traction Control System to deliver increased traction in rough terrain. An available 4WDemand part-time four-wheel drive system utilizes Active Traction Control and a two-speed transfer case with low-range gearing to upgrade off-road performance. Toyota 4Runner Limited models employ a full-time 4WD system with a Torsen® locking center differential. A Multi-Terrain Select system provides driver-selectable terrain modes to further improve performance. Toyota 4Runner models provide an impressive level of equipment in standard configurations that starts with a Toyota Entune infotainment system that features a 6.1-inch touchscreen display, Bluetooth capabilities and much more. A power liftgate, keyless entry and a 120-volt power outlet are standard features that will upgrade your day-to-day drive. If you opt for the SR5 Premium or TRD Off-Road Premium, you will enjoy Toyot SofTex interior, heated front seats and navigation. Available upgrades include a Kinetic Dynamic Suspension System, a Toyota X-REAS suspension and more. New additions to the 2018 Toyota 4Runner spec sheet include an available Wilderness Package and a TRD Enhancement Package. The Wilderness Package is available for the 4Runner SR5, SR5 Premium, TRD Off-Road and TRD Off-Road Premium grades and will add a roof rack, all-weather floor mats and a cargo tray. The TRD Enhancement Package is available for TRD models and adds TRD 17-inch matte gray wheels and a TRD aluminum skid plate.